Opens in 8 h 35 min. Austin TX Locksmiths gives substitution to lost auto key, broken key, transponder keys and high security laser cut keys for Most makes and models. We are accessible day and night to enable you to out with your auto crisis, so don't hesitate to call us 24 hours per day, seven days seven days. 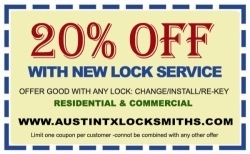 Be the first to write a review for Austin TX Locksmiths! Austin TX Locksmiths Austin TX Locksmiths gives substitution to lost auto key, broken key, transponder keys and high security laser cut keys for Most makes and models. We are accessible all day and all night to enable you to out with your locksmith crisis require.